There are approximately 250 species of ‘solitary’ bees indigenous to the UK. The most likely ‘solitary’ bees you will attract using a beepalace are called red mason (osmia rufa) or leafcutter bees (megachile willughbiella). Unlike honey bees they do not produce honey, nor do they live in groups or swarm. They very seldom, if ever, use their weak sting (maybe if you trod on one). “Solitary” bees are very low maintenance (you only need to replace the tubes inside the beepalace every few years). The nesting tubes in the beepalace replicate the cavities ‘solitary’ bees seek out in nature which have been vastly depleted by building works, hedge cutting and the trend towards having more hard landscaping. 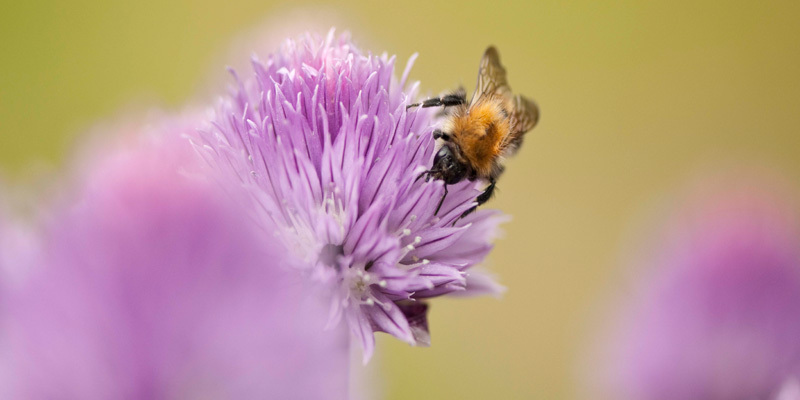 By having a beepalace in your garden and also providing the type of flowers, fruit and vegetables that they pollinate you will help arrest the decline of these vital creatures and you’ll attract a variety of other pollinators such as butterflies, bumblebees and moths that will help bring your garden to life. Research has found that an acre of apple orchard required only 250 “solitary” bees to pollinate it compared to up to 20,000 honey bees. The importance of bees to our Ecosystem is not that they make honey, but that they, along with other creatures such as some bats, flies, butterflies, moths, beetles and some types of wasps, pollinate many flowers, fruit and vegetables that we depend upon. Around one third of the food we eat (that is every third mouthful!) requires pollination. Our world would be much poorer both visually and in diet without pollinators fertilising our gardens, orchards and fields. Einstein apparently commented that after the last bee died mankind would not be far behind! If many more bees do die, we will certainly be living in a much less colourful and fruitful place. The decline of bees and pollinators in general doesn’t just need to be appreciated in numbers. Swathes of pollinators have been wiped out through a variety of reasons – fragmentation of habitat (new buildings, patios, forecourts etc. ), insecticides and fertilisers containing harmful substances and climate change. Also those of us who are old enough only have to remember when we were young how many insects were flattened on the windscreen of our parent’s cars when we were driven down a long fast road in the summer, or how the simple sound of buzzing was so audible 10 or 20 years ago. That has changed and will continue to unless we encourage pollinators to return to our gardens, farms and fields. The beepalace is designed to encourage people to grow the type of flowers and fruit and vegetables that pollinators fertilise and at the same time to enhance the look of your garden by using the beepalace to maximum aesthetic and practical use. 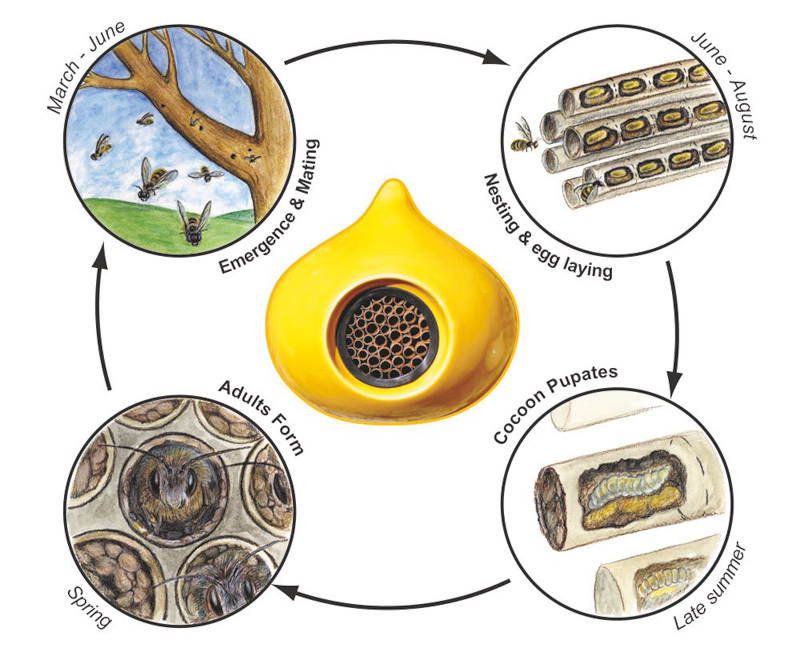 The life-cycle of a ‘solitary’ bee. The beepalace is designed as a nesting place for ‘Solitary’ bees. It needs to be placed in a south to south westerly position between 4 to 6 feet above the ground. By planting the type of plants, flowers, trees and shrubs that bees pollinate (see list) you can create an environment that bees will enjoy. ‘Solitary’ bees rarely use their weak sting and do not swarm. They are docile but are extremely hard workers and are essential pollinators for many flowers, fruit and vegetables. The nesting tubes inside the beepalace replicate the type of nesting places ‘Solitary’ bees are attracted to but which have been greatly reduced through modern farming techniques the expansion of towns and cities and the popularity of low maintenance gardens. We hope that by owning a beepalace you will become more aware of the perils facing some aspects of your environment as well as making your garden a more interesting and attractive place. Typically the beepalace should be placed 4 to 6 feet from the ground and set with the opening in a south or southwest direction. As many of the suggested shrubs and flowers (see list) that you can attractively accommodate in your garden should be planted. ‘Solitary’ bees are usually active from Spring to late Summer. You will notice when they are using the beepalace and either a mud pellet or green leaf, in the case of leaf cutter bees, will appear at the end of the nesting tubes. 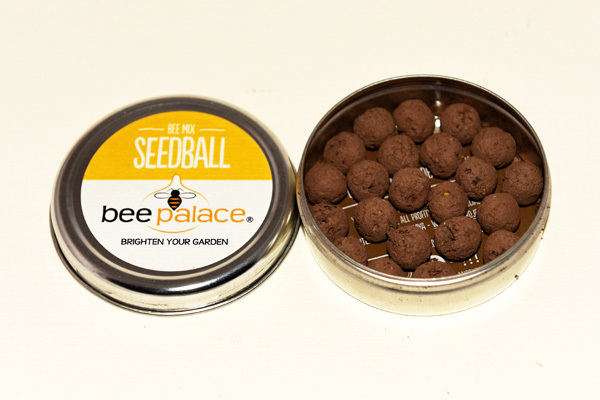 We have co-branded some bee mix seed balls with our lovely friends at Seedball. 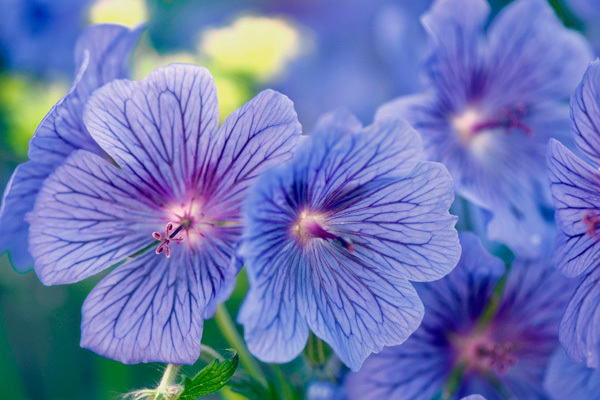 As well as making it really easy to plant some great bee friendly flowers, some of the proceeds go to Project Maya which is dedicated to producing urban nature reserves across the globe – yay!